We’re continuing our celebration of The Beatles‘ first U.S. #1 hit. 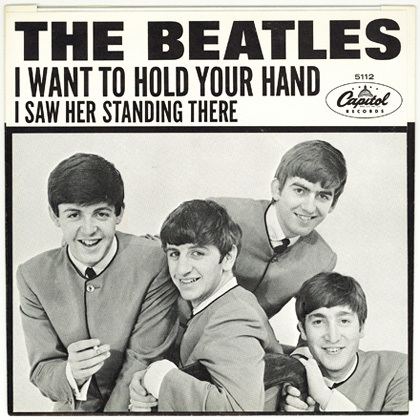 A few weeks’ ago, Best Classic Bands commemorated the U.S. release of The Beatles “I Want to Hold Your Hand,” which occurred on December 26, 1963, as well as the song’s first U.S. chart appearance. When the song hit #1 five weeks’ later On This Day, February 1, 1964, it became the first of seven #1 singles they achieved in a one-year period, launching Beatlemania, the British Invasion and the classic rock era. It’s hard to imagine – impossible really – but Capitol Records, which essentially became synonymous with the rise of The Beatles in America, had turned down their sister U.K. label Parlophone’s efforts to release the group’s singles stateside. Capitol had scheduled it for a mid-January 1964 release but clever U.S. radio DJs who were privy to the song’s overseas success arranged to get copies shipped to them and began playing the import early. This forced Capitol’s hand – they actually contemplated seeking a court order to halt airplay. Finally recognizing that they could use the radio activity to their advantage, the single’s release date was moved up to December 26 to take advantage of the demand. With the floodgates opened, the 45 is reported to have sold 250,000 copies within days. On January 18, 1964, “I Want To Hold Your Hand” debuted on the Hot 100 Singles Chart at #45. When it hit #1 on Feb. 1, it ended up staying at the top for seven weeks. Here’s a clip of their performance on The Ed Sullivan Show eight days later on February 9, 1964. I SAW HER STANDING THERE !!! Part of the impact this single had was due to the quality of the recording process. Both “IWHYH” and “This Boy” were recorded on a Studer 1-inch 4-track machine, which provides a much higher-quality sound than the smaller machines they had been using previously, and all other artists were still using. My initial impression of this song was that it literally “jumped” out of the radio.